Draco volans, or the Flying Dragon, is a member of the genus of gliding lizards Draco. It can spread out folds of skin attached to its movable ribs to form "wings" that it uses to glide from tree to tree over distances upwards of 8 metres (26 ft); however, like all modern reptiles, it lacks the ability to sustain powered flight, and is capable only of gliding. Its wings are brightly coloured with orange, red and blue spots and stripes, and they provide camouflage when folded. The flying dragon can reach up to 19–23 centimetres (7.5–9.1 in) in length. It feeds on arboreal ants and termites. They are classified as dragons in the phylum Chordata, subphylum Vertebrata, class Reptilia, order Squamata, family Agamidae. Common Gliding Lizards (D. sumatranus) and Spotted Gliding Lizards (Draco maculatus) are common in open and disturbed areas; Five-banded Gliding Lizards (D. quinquefasciatus) are usually found in dense forest with relatively small, closely spaced trees; Giant Gliding Lizards (D. maximus) are somewhat restricted to riparian areas; the smaller Yellow-bearded Gliding Lizards (D. haematopogon) and larger Blanford's Gilding Lizard (Draco blanfordi) occur at higher elevations than most other species; and the Black-bearded Gliding Lizards and the larger Dusky Gliding Lizards (D. formosus) are habitat generalists in lowland forests. Flying Dragons are brown with bluish coloration on the undersides of their wings and a yellow colored dewlap. Females tend to have bluish dewlaps and yellow coloring on the wings' undersides. Their heads are blunted and fairly short, and each leg has five clawed toes. Flying Dragons have low, long bodies. They have flaps of skin along the ribs, which can be extended into "wings" by the lizard elongating its ribs. They have a dewlap, or gular flap, which can also be extended. Generally, Flying Dragons grow to a little less than 12 inches in length. Although females are usually larger than males, their dewlaps are a bit smaller. This lizard can get to about 20 cm long. Its wingspan is usually 3/4 of its body length. During breeding season the female flying dragon will venture down to the forest floor and bury her 1-4 eggs in the soil. Its range is the Philippines to Malaysia and Indonesia. 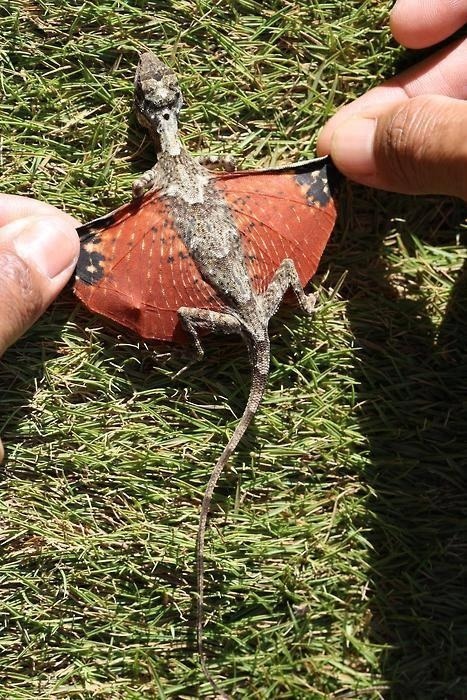 In order to move from one place to another, Flying Dragons will spread the skin flaps along their abdomens and glide out of trees or from other high areas. They never glide when it is raining or when it is windy. When the Flying Dragon is about to take off, it will point its head toward the ground.